Leicester Tigers sealed their place in the Premiership play-offs, ending Sale hopes of a top-four finish with a comfortable win at the AJ Bell Stadium. 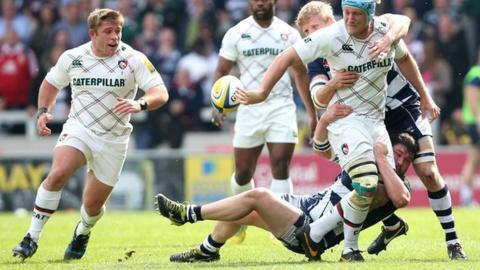 Tries from Niki Goneva and Toby Flood put Leicester 14-3 up at the break, Danny Cipriani responding for Sale. Flood then added his second, in between Niall Morris' effort and a penalty try. Sale hit back through Johnny Leota, Michael Paterson and Henry Thomas before David Mele grabbed Leicester's sixth try, converted by Owen Williams. The Sharks needed to beat third-placed Tigers to give themselves a chance of pipping Richard Cockerill's side to a spot in the end-of-season play-offs. After Williams missed a penalty from halfway, a chip-kick over defence from the fly-half allowed Goneva to pounce after Manu Tuilagi had looked the most likely to touch down. Cipriani teed up the host's only first-half points with a penalty soon after, while Williams went on to miss another two penalty attempts of his own before the break. Anthony Allen appeared to have extended Leicester's advantage after getting onto the end of a Morris kick, but the video referee denied the centre after spotting a forward pass in build-up play. France-bound Flood, who replaced Allen after he was injured making a try-saving tackle on Tom Brady, then put Leicester 14-3 ahead after making the most of an overlap out wide created by Ben Youngs and Jordan Crane. Williams put Morris through for the Tigers' third try early in the second half, while Flood then linked up with Youngs for his second and was then held up over the line in search of a hat-trick. Williams converted Leicester's penalty try to put the visitors 35-3 up. A looping pass from Sam Tuitupou put Paterson through for the Sharks, sparking a late revival. Thomas then crossed on the back of a lineout, before Leota touched down a breakaway score shortly after. Joe Ford kicking two from three conversions. With Sale down to 14 men after Tom Arscott was sin-binned, Mele went over for Leicester's sixth try with the last play of the game. "Toby Flood did some good things out there for us. Over the last few weeks it's been a bit of a difficult time for him but I thought that he showed how good his attitude was today and we were really pleased with him. "It's nice that we've got to this point but we want to win it. I know everyone's sitting back and saying we're in a semi-final and that's ok considering the problems we've had - but that's not what we're about. "We're going to have to go away unless something horrible happens to Saints and we've got to get it right next week as well. We want to still win this and we still think that we can win it and that we're good enough. "We are still the champions at this point and we haven't been as good as we could have been at some points this year - but we've given ourselves a fighting chance." "I was disappointed with the ref and some of his decisions in the scrum. In the first half he was outrageous. "I don't like to blame the referees because sometimes they get it right or get it wrong and he isn't the reason we've lost - but there were two decisions in the first half where he was horrendously wrong. "We were beaten by the better side. In the first half, they deserved to be in front. They scored two good tries, they worked out our line speed and chipped over it. We had a disastrous start to the second half and we then came back in the last 20 minutes, so we're disappointed. "There was something missing. We ended the season psychologically a few weeks ago - even though we don't admit that to each other. We climbed the mountain a few weeks ago against Northampton, Bath and Exeter and it's very difficult to motivate yourself after that." Sale: Arscott; Brady, Leota, Tuitupou, Ingall; Cipriani, Peel; Lewis-Roberts, Jones, Cobilas, Ostrikov, Paterson, Gaskell, Seymour, Fihaki. Replacements: Jennings for Ingall (19), Harrison for Lewis-Roberts (47), Thomas for Cobilas (47), Ford for Cipriani (54), Easter for Fihaki (54), Cliff for Peel (60), Kulemin for Ostrikov (60). Leicester: Tait; Morris, Tuilagi, Allen, Goneva; O Williams, B Youngs; Ayerza, T Youngs, Mulipola, Slater, Parling, Gibson, Salvi, Crane. Replacements: Flood for Allen (29), Briggs for T Youngs (47), Balmain for Mulipola (54), Deacon for Slater (58), Mele for B Youngs (59), Waldrom for Crane (59), Stankovich for Ayerza (61), Scully for Tait (69).